HepaRG cells, derived from a female hepatocarcinoma patient, are capable of differentiating into biliary epithelial cells and hepatocytes. More importantly, differentiated HepaRG cells are able to maintain activities of many xenobiotic-metabolizing enzymes, and expression of the metabolizing enzyme genes can be induced by xenobiotics. The ability of these cells to express and induce xenobiotic-metabolizing enzymes is in stark contrast to the frequently used HepG2 cells. The previous studies have mainly focused on a set of selected genes; therefore, it is of significant interest to know the extent of similarity of gene expression at whole genome levels in HepaRG cells and HepG2 cells compared with primary human hepatocytes and human liver tissues. To accomplish this objective, we used Affymetrix (Santa Clara, CA) U133 Plus 2.0 arrays to characterize the whole genome gene expression profiles in triplicate biological samples from HepG2 cells, HepaRG cells (undifferentiated and differentiated cells), freshly isolated primary human hepatocytes, and frozen liver tissues. After using similarity matrix, principal components, and hierarchical clustering methods, we found that HepaRG cells globally transcribe genes at levels more similar to human primary hepatocytes and human liver tissues than HepG2 cells. In particular, many genes encoding drug-processing proteins are transcribed at a more similar level in HepaRG cells than in HepG2 cells compared with primary human hepatocytes and liver samples. The transcriptomic similarity of HepaRG with primary human hepatocytes is encouraging for use of HepaRG cells in the study of xenobiotic metabolism, hepatotoxicology, and hepatocyte differentiation. Drug-induced liver injury is one of the leading causes for the failure of drug approval and the withdrawal of approved drugs from the market (Lasser et al., 2002). Animal models are frequently used to identify potentially hazardous drugs for liver injury. However, more than 50% of drugs that induce liver injury in human clinical trials are not hepatotoxic to animals (Olson et al., 2000). Therefore, human liver cells are needed for more accurate in vitro screening of drug toxicity. Freshly isolated primary human hepatocytes are currently the “gold standard” as in vitro human liver cells for understanding the pathways and mechanisms influencing drug metabolism and disposition, as well as hepatotoxicity (LeCluyse et al., 2000; Luo et al., 2004; Kato et al., 2005). However, these cells are fraught with difficulties, including their scarce and unpredictable availability, limited growth potential, differences in batch to batch preparation, short lifespan, and propensity to undergo early and variable phenotypic alterations. Cytochrome P450 (P450) expression decreases quickly over time, probably because of the adaptation of cells to the culture environment (LeCluyse, 2001; Rodriguez-Antona et al., 2002). In addition, basal gene expression in freshly isolated primary human hepatocytes is also distinctively different from one culture to another, which can introduce additional bias (Richert et al., 2006). To overcome these difficulties, researchers have been searching for stable human liver cell lines for a long time. Currently used human liver cell lines are generally derived from hepatic tumors. It is unfortunate that most of them have altered gene expression profiles that lack most liver-specific functions. In particular, P450 gene expression and enzyme activities are usually very low or undetectable in these human liver cells. For example, HepG2 cells, the most frequently used human liver cell line, express many P450 genes at very low levels (Sassa et al., 1987). Although some P450 genes, such as CYP1A1 and CYP3A7, are expressed in HepG2 cells (Ogino et al., 2002), these P450 members are fetal-specific and not expressed in most adult livers. These facts indicate that many changes in gene expression have happened in HepG2 cells after they were derived from the liver tissue of a differentiated hepatocellular carcinoma. More recently, a new human liver cell line, HepaRG, is available. Although this cell line is also derived from a female hepatocarcinoma patient, unlike other human liver cell lines, HepaRG cells express many drug-processing genes at similar levels compared with primary human hepatocytes under a certain culture condition (Aninat et al., 2006; Kanebratt and Andersson, 2008a). These drug-processing genes encode Phase I drug-metabolizing enzymes (CYP1A2, CYP2B6, CYP2C9, CYP2E1, and CYP3A4), Phase II enzymes [UDP glucuronosyltransferase 1 family, polypeptide A1 (UGT1A1), glutathione transferase α1 (GSTA1), GSTA4, and GSTM1], gene regulatory proteins (aryl-hydrocarbon receptor, pregnane X receptor, and constitutive androstane receptor), liver-specific proteins (albumin, haptoglobin, and aldolase B), as well as α-fetoprotein, glutathione-related enzymes (γ-glutamylcysteine synthase regulatory subunit, γ-glutamylcysteine synthase catalytic subunit, glutathione synthase, and glutathione reductase), and thioredoxin. The activities of several Phase I and Phase II drug-metabolizing enzymes were also comparable between HepaRG and freshly isolated human hepatocytes (Aninat et al., 2006). HepaRG cells also respond to pregnane X receptor, constitutive androstane receptor, and aryl-hydrocarbon receptor activators, resulting in induction of CYP1A1, CYP1A2, CYP2B6, CYP2C8, CYP2C9, CYP2C19, and CYP3A4 in vitro (Kanebratt and Andersson, 2008b; Lambert et al., 2009a,b). HepaRG cells can maintain a proliferative status in an undifferentiated culture medium for several weeks at subconfluence. At confluence, as well as with the addition of a differentiation-inducing culture medium, HepaRG cells are capable of differentiating into biliary epithelial cells and hepatocytes (Gripon et al., 2002). The genes encoding liver-specific factors, drug-metabolizing enzymes, transporters, and transcription factors are stably expressed over a multiweek culture period. Given the stable expression of these liver-enriched factors over a long time in culture and the activity of several drug-metabolizing enzymes, HepaRG cells have been touted as surrogates to primary human hepatocytes for drug metabolism and disposition studies (Guillouzo et al., 2007; Hewitt et al., 2007). The ability of the HepaRG cells to express and induce xenobiotic-metabolizing enzymes is in stark contrast to the frequently used human liver cell line, HepG2. Although HepaRG cells and HepG2 cells have been compared with human primary hepatocytes and liver tissues for their gene expression and enzyme activities of drug metabolism, the studies were done in a limited set of genes. Therefore, it is of significant interest to know the extent of similarity of gene expression at whole genome levels of HepaRG cells and HepG2 cells compared with primary human hepatocytes and human liver tissues. Human Liver Tissues, Primary Human Hepatocytes, and Cultured Cells. Three different human liver tissue samples were provided by XenoTech, LLC (Lenexa, KS). These subjects were white females aged 42, 56, and 60 years. The female samples were chosen because the HepaRG cell line was derived from a female patient. The samples were acquired by XenoTech, LLC through the Midwest Transplant Network (Westwood, KS). The livers were cooled immediately after procurement with a cold perfusion solution and frozen within 6 h.
Three different primary human hepatocyte samples were provided by Biopredic International (Rennes, France). The primary human hepatocytes were isolated from the liver tissues donated by three white female patients undergoing resection for primary or secondary tumors at age 54, 65, and 76 years. The hepatocytes were isolated by collagenase perfusion of histologically normal liver fragments and seeded overnight hepatocyte monolayers in seeding medium. After 2-day culture in short-term culture medium, total RNA was isolated from the hepatocyte monolayer with TRIzol. All the liver fragments were not infected by hepatitis B, hepatitis C, and HIV-1 viruses. HepaRG cells were obtained from Biopredic International. The cells in the original culture dish were detached by gentle trypsinization and seeded at 1 × 105 undifferentiated cells/cm2 (high density) in hepatocyte wash medium (Invitrogen, Carlsbad, CA) supplemented with additives for growth media (Biopredic International). The cells were incubated at 37°C and 5% CO2. The medium was renewed every 3 days. After incubation for 14 days, the undifferentiated HepaRG cells were induced to differentiate with additives for differentiation medium (Biopredic International) for another 14 days. That medium was also renewed every 3 days. HepG2 cells were obtained from the American Type Culture Collection Cell Biology Collection (Manassas, VA). The cells were seeded at 1 × 105 cells/cm2 in a 75-cm2 flask with minimum essential medium supplemented with 10% fetal bovine serum (Sigma-Aldrich, St. Louis, MO) and 5% of penicillin/streptomycin (Sigma-Aldrich). The cells were incubated at 37°C and 5% CO2. The cells were used at the time of 90 to 100% confluence. Total RNAs of the liver tissues, primary human hepatocytes, undifferentiated and differentiated HepaRG cells, and HepG2 cells were isolated by using Invitrogen TRIzol reagent following the manufacturer's instructions. RNA quality, quantity, and integrity were analyzed by using the Agilent Bioanalyzer 2100 (Agilent Technologies BV, Amstelveen, The Netherlands). The whole genome gene expression profiles of the adult liver tissues, primary human hepatocytes, differentiated and undifferentiated HepaRG cells, and HepG2 cells were determined by the Microarray Core Facility at the University of Kansas Medical Center using Affymetrix U133 Plus 2.0 arrays (Affymetrix, Santa Clara, CA) in triplicate biological replicates of each sample type. The target preparation, library labeling, hybridization, postwash, and signal scanning were performed based on the Affymetrix's instructions. The raw microarray data in .CEL files are available in the Gene Expression Omnibus with accession number GSE18269 at http://www.ncbi.nlm.nih.gov/geo/. The microarray data were normalized using GeneChip (Affymetrix) Robust Multichip Average algorithm (Wu et al., 2004) implemented in the R package affylmGUI (Wettenhall et al., 2006) when any two or more datasets are compared. “Present,” “Marginal,” and “Absent” calls were made in R using the MAS5 algorithm in the affy package (Irizarry et al., 2003). A linear model was used to average data among three replicate arrays and also to look for variability among them. A probe was removed if it did not correspond to a mapped gene or did not register at least two “Present” calls in triplicate datasets by the MAS5 algorithm for all five groups. The remaining probes, hereafter defined as quality-filtered probes, were used for further analysis. The similarity of whole genome gene expression profiles of HepaRG cells and HepG2 cells compared with human liver tissue and primary human hepatocytes was analyzed by similarity matrix, principal components, and hierarchical clustering. The similarity matrix between any two sets of the data was presented by the Pearson product-moment correlation coefficient (r) value, which measured the strength of the linear relationship between two sets of variables. Principal component analysis was applied to identify similarity and differences of the whole genome gene expression profiles among the different samples. In addition to the whole genome gene expression profiles, some liver-specific functional pathways, particularly the drug-processing pathways, were also compared among the different samples. To define significant pathway differences during differentiation of HepaRG cells, we used the Functional Annotation Clustering Tool in DAVID (Dennis et al., 2003). Gene lists were made of Affymetrix IDs where the average replicate difference was greater or less than a log2 value of 1. Each gene list was uploaded using Affymetrix IDs and run against a background containing only the quality-filtered probe sets. The Group Enrichment Score, which represents the geometric mean (in log2 scale) of member's p values in a corresponding annotation cluster, was used to rank biological significance. Thus, the top ranked annotation groups most likely have consistently lower p values for their annotation members. For a pathway or process to be defined, the Enrichment Score was set at 2. Whole genome gene expression profiles of HepG2 cells, undifferentiated and differentiated HepaRG cells, primary human hepatocytes, and human liver tissues were generated by using Affymetrix U133 Plus 2.0 arrays in triplicate samples. A total of 54,675 probe sets existed on each array. After the probes that did not correspond to a mapped gene or did not register at least two “Present” calls in the triplicate datasets for all five groups were removed, the remaining quality-filtered 30,849 probe sets were selected for similarity and difference analysis by similarity matrix, principal components, and hierarchical clustering methods. Hybridization signal intensities in log2 scale on the 30,849 probe sets among the tested samples are presented in Supplemental Table S1. A similarity matrix was constructed for each pairwise comparison of any two sets of the data (Fig. 1A). The Pearson product-moment correlation coefficient (r) was used to represent the strength of the linear relationship between any two sets of variables. The relative higher r values (0.949–0.996) were found between any two replicates in each type of the five groups with a range between 0.991 and 0.995 in HepG2 cells, 0.995 and 0.996 in undifferentiated HepaRG cells, 0.989 and 0.995 in differentiated HepaRG cells, 0.979 and 0.984 in primary human hepatocytes, and 0.949 and 0.971 in human livers. The relative lower r values (0.768–0.937) were observed between any two sets of the data from the different types of samples. The r values in each group were then averaged to represent similarity of whole genome gene expression between any two groups of the samples (Fig. 1B). The highest r value (0.966) was found between undifferentiated and differentiated HepaRG cells. The second highest r value (0.920) existed between primary human hepatocytes and human livers. The r value between human primary hepatocytes and undifferentiated HepaRG (0.887) or between human primary hepatocytes and differentiated HepaRG (0.891) was higher than the r value between human primary hepatocytes and HepG2 (0.813). Likewise, the r value between human livers and undifferentiated HepaRG (0.883) or between human livers and differentiated HepaRG (0.881) was higher than the r value between human livers and HepG2 (0.791). 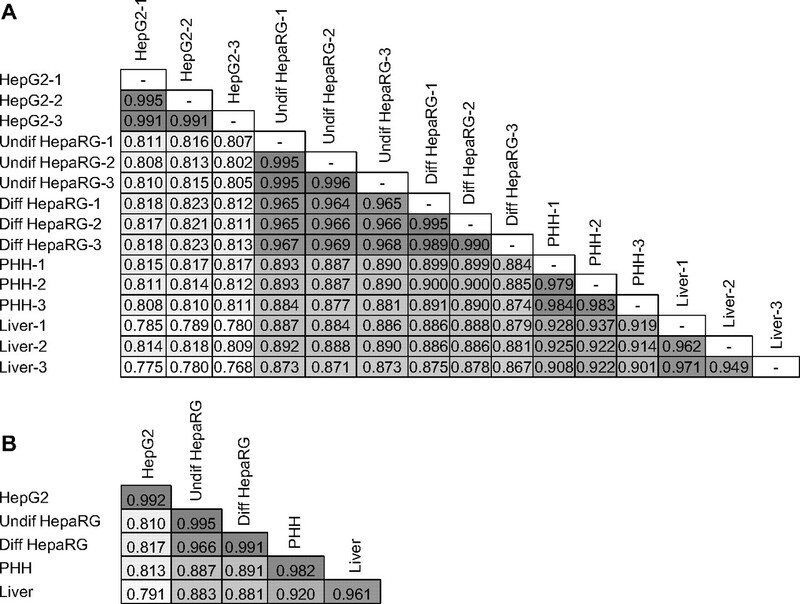 A, similarity matrix of gene expression profiles for each pairwise comparison of HepG2 cells (HepG2-1, -2, -3), undifferentiated HepaRG cells (Undif HepaRG-1, -2, -3), differentiated HepaRG cells (Diff HepaRG-1, -2, -3), primary human hepatocytes (PHH-1, -2, -3), and human liver tissues (Liver-1, -2, -3). The number in each column represents Pearson's product-moment correlation coefficient r value. B, average correlation coefficient r values for each type of the biological replicates within each group and between two groups. Data based on 30,849 probe sets passing a quality-filtering test. The background colors in each column indicate different levels of the r values. We further examined the number of probes with signal intensities different by more than 2-fold between any two sets of the data. Figure 2 shows that approximately 10% of the total quality-filtered 30,849 probe sets expressed differently between undifferentiated and differentiated HepaRG cells. The number of probes increased to approximate 22% between human liver tissues and primary human hepatocytes. The differentially expressed probes were 26 to 28% between HepaRG cells and human liver tissues or primary human hepatocytes. However, up to approximately 37 to 39% of the probes were differently expressed between HepG2 cells and human liver tissues or primary human hepatocytes or HepaRG cells. Numbers and percentages of probe sets with differential gene expression by more than 2-fold between any two groups of the samples. The comparison was based on average signal intensities on each set of the probes from three replicates in each group of the samples. We further characterized the 10% of probes with expression levels different by more than 2-fold between undifferentiated and differentiated HepaRG cells. The probes were listed in Supplemental Table S2. A total of 1321 probes had 2-fold higher signal intensities in differentiated HepaRG cells than in undifferentiated HepaRG cells. Pathway analysis indicated that the up-regulated genes included xenobiotic and steroid metabolism, cell cycle genes, DNA replication and repair, and nuclear and endoplasmic reticulum proteins. Another 1831 probes had 2-fold lower signal intensities in differentiated HepaRG cells than in undifferentiated HepaRG cells. The down-regulated genes during HepaRG differentiation were involved in developmental processes, extracellular signaling, actin binding, and amino acid metabolism. The similarity and differences in whole genome gene expression among HepG2 cells, undifferentiated and differentiated HepaRG cells, primary human hepatocytes, and human liver tissues were further highlighted by Principal Component Analysis. The intensities of the quality-filtered 30,849 probe sets were first log2-transformed. Three replicate sets of the data were averaged and then used in the Principal Component Analysis. The three most variable principal components (PC1, PC2, and PC3) were plotted in three dimensions in Fig. 3. 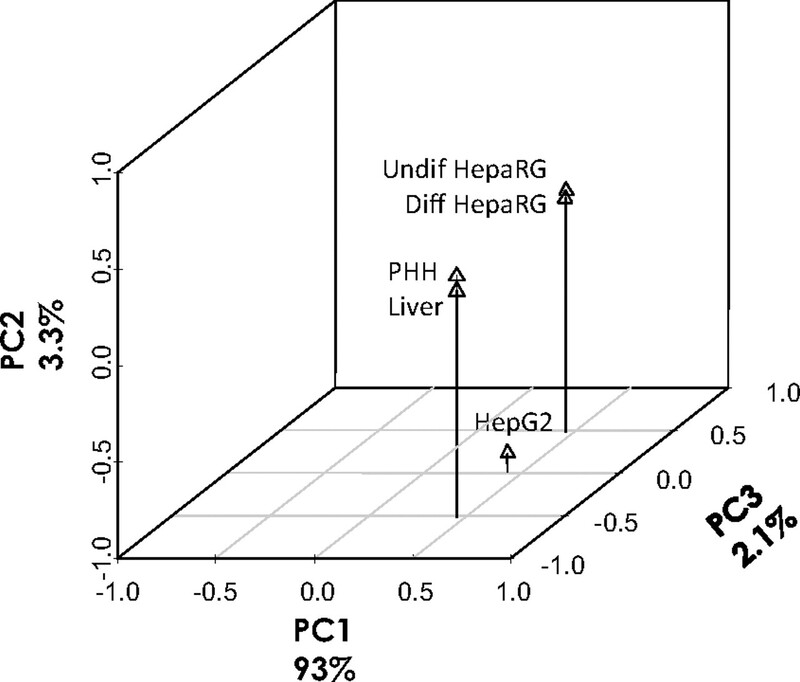 HepG2, undifferentiated and differentiated HepaRG, primary human hepatocytes, and human livers contributed nearly equally to the variations in PC1 (93.0%). HepG2 made a major contribution to the variations in PC2 (3.3%). Undifferentiated and differentiated HepaRG cells contributed the majority of the variations in PC3, which only counted 2.1% of total components. Principal component analysis on variations of gene transcription among HepG2 cells (HepG2), undifferentiated HepaRG cells (Undif HepaRG), differentiated HepaRG cells (Diff HepaRG), primary human hepatocytes (PHH), and liver tissues (Liver). For the 30,849 probes passing quality filtering, the relative contribution of the variance is shown by three major principal components plotted in three dimensions. Hierarchical clustering of gene expression data is a more intuitive way to analyze the many different possible combinations of differentially expressed genes. Figure 4A shows a two-way clustering diagram of five groups of the triplicate samples based on the intensities of the quality-filtered 30,849 probe sets on the arrays. The data showed again that the relationship within each group was closer than the relationship between different groups. Within each group, undifferentiated HepaRG cells had the least variation, and liver tissues had the biggest variations. Between different groups, differentiated and undifferentiated HepaRG cells are more closely related to primary human hepatocytes than human liver tissues. HepG2 cells have the farther clustering distances to all the other groups. A, hierarchical clustering analysis of gene expression for HepG2 cells (HepG2-1, -2, -3), undifferentiated HepaRG cells (Undif HepaRG-1, -2, -3), differentiated HepaRG cells (Diff HepaRG-1, -2, -3), primary human hepatocytes (PHH-1, -2, -3), and human liver tissues (Liver-1, -2, -3). The clustering is based on the 30,849 probes passing quality filtering. B, hierarchical clustering analysis of expression of Phase I drug-metabolizing enzyme genes (ADHs, ALDHs, P450s, and FMOs), Phase II drug-metabolizing enzyme genes (GSTs, NATs, SULTs, and UGTs), and membrane transporter genes (ABCBs, ABCCs, ABCGs, and SLCOs). The clustering is based on average signal intensities from the three replicates in each group of the samples. We further selected 115 genes annotated as being involved in xenobiotic metabolism, including the genes encoding Phase I and Phase II metabolizing enzymes and membrane transporters (a gene list and average signal intensities in log2 scale from the three replicate sets are provided in Supplemental Table S3). The average signal intensities on the probes annotated to the selected genes were clustered in Fig. 4B shown in the groups of Phase I enzymes [alcohol dehydrogenases (ADHs), aldehyde dehydrogenases (ALDHs), P450s, and flavin monooxygenases (FMOs)], Phase II enzymes [GSTs, N-acetyl transferases (NATs), sulfotransferases (SULTs), and UGTs], and transporters [ATP-binding cassette (ABC)Bs, ABCCs, ABCGs, and solute carrier organic anion transporters (SLCOs)]. A similar clustering pattern as in the whole genome analysis was observed in the Phase I and Phase II metabolizing enzymes and indicated that HepG2 cells are the most dissimilar to the rest of the groups. A comparison of the expression values of these drug-response genes among HepG2 cells, differentiated HepaRG cells, and primary human hepatocytes is also shown in Supplemental Fig. S1 with mean and S.D. Differences of the expression levels between HepG2 cells and primary human hepatocytes, as well as between differentiated HepaRG cells and primary human hepatocytes, were determined in a Student's t test. 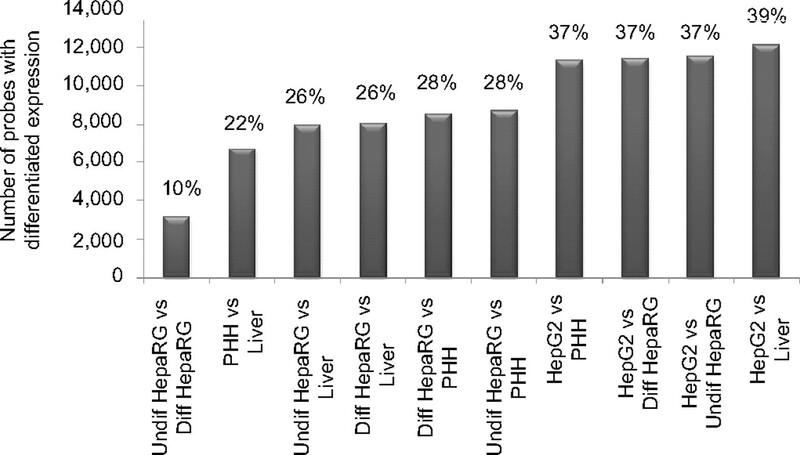 Overall, difference of gene expression in these drug-response genes between HepG2 and primary human hepatocytes is much bigger than between HepaRG and primary human hepatocytes. For example, all the drug-metabolizing P450 genes are expressed at a significantly different level of ***, p < 0.001, except CYP3A43 at **, p < 0.01, in HepG2 than in primary human hepatocytes (Fig. S1A), but only CYP2D6 is expressed at a significantly different level of ***, p < 0.001 in HepaRG than in primary human hepatocytes, and CYP1A2, CYP2A6, and CYP2C8 are at a significantly different level of **, p < 0.01. A similar situation is also found for many other drug-response genes, such as ADH1A, ADH1B, ADH1C, ADH4, ALDH1L1, ALDH1L2, ALDH9A1, NAT1, NAT2, GSTA1, GSTA3, GSTK1, SULT1A1, SULT1A2, SULT2A1, UGT1A1, UGT1A6, UGT2B4, UGT2B15, UGT2B17, UGT3A1, ABCB1, ABCB4, ABCC10, SLCO2B1, and so on (Fig. S1). HepaRG cells were derived from a human hepatocarcinoma liver tissue. Abnormality of the karyotype in HepaRG cells has been identified with a trisomic chromosome 7 and a translocated chromosome from 22 to 12 (Gripon et al., 2002). Here, we examined whether the karyotype abnormality has any influence on gene expression. Gene expression profiles across each chromosome were compared between differentiated HepaRG cells and primary human hepatocytes. Among the all the chromosomes, only chromosome 7 had a significant higher gene expression level (p < 0.001 in a t test) in differentiated HepaRG cells compared with primary human hepatocytes (Fig. 5A). The rest of the chromosomes, including the translocated chromosome 22 (Fig. 5B; p = 0.084 in a t test), did not show significant difference of gene expression between differentiated HepaRG cells and primary human hepatocytes. 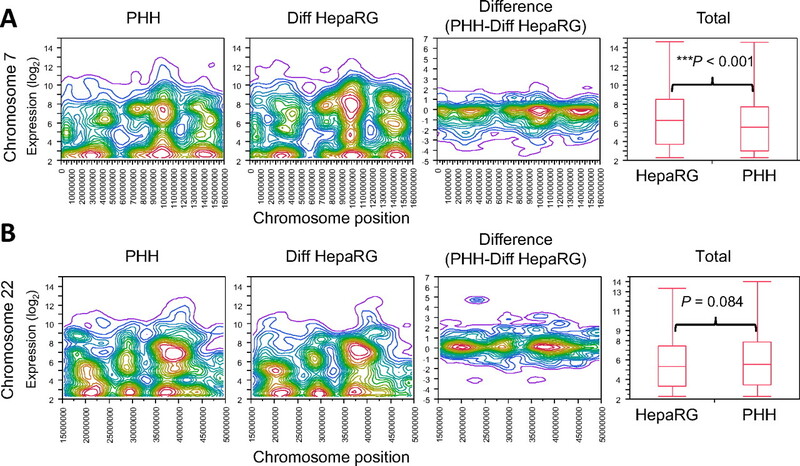 Comparison of gene expression profiles across chromosomes 7 (A) and 22 (B) between primary human hepatocytes (PHH) and differentiated HepaRG cells (Diff HepaRG). In the first two panels, the y-axis represents the signal intensity levels in log2 scale, and the x-axis indicates the genomic positions along the chromosomes where the microarray probes are located for PHH and Diff HepaRG, respectively. The third panel was constructed by subtracting PHH values from Diff HepaRG signal values for each probe on the chromosome and then clustered as in the first two panels. For example, if the expression of a given probe was 5 in PHH and 3 in Diff HepaRG, then that value would be 5 − 3 = 2. Negative values indicate probes with lower expression in PHH than Diff HepaRG. Blue areas represent few data points, whereas red areas indicate more data points. In the fourth panel, signal intensity levels from all the probes on each chromosome are compared between Diff HepaRG and PHH with mean and S.D. The differences are tested by a t test. ***, p < 0.001 indicates that a significant difference is identified between the two sets of samples. The current study used Affymetrix gene expression arrays to establish genome-wide gene expression profiles of HepaRG cells at both undifferentiated and differentiated stages and compared the genome-wide gene expression profiles of HepaRG cells and HepG2 cells with human primary hepatocytes and human liver tissues using similarity matrix, principal components, and hierarchical clustering methods. The comparison was also done for many drug-response genes. These analyses conclude that the mRNA content in HepaRG cells more accurately reflects primary human hepatocytes and human liver tissues than HepG2 cells. The similarity matrix analysis shows the relative high r values (0.949–0.996) between any two replicates within a same type of the samples. These high r values indicate that the gene expression profiles generated by the Affymetrix gene expression arrays are highly reproducible. It is not surprising that the r values between the replicate samples in the cultured HepG2 and HepaRG cells were higher than in primary human hepatocytes and human liver samples because the cultured cells consisted of a highly homogenous cell population with little environment-mediated perturbations, but primary human hepatocytes and human liver samples came from different individuals in which their gene expression could be influenced by many factors that cannot be controlled in the experiment. In particular, the r values within the liver tissue samples (0.949–0.971) are relatively lower than the r values within other groups, indicating that a certain degree of variation exists among the individual liver samples, which may be caused by interindividual variations or mRNA quality of the liver tissues. When similarity is compared between different groups of the samples, differentiated HepaRG and undifferentiated HepaRG cells are still highly similar (r = 0.966 in Fig. 1B) with only a small proportion of the probes (∼10% in Fig. 2) expressed differentially by more than 2-fold. A list of differentially expressed genes and pathways can be found in Supplemental Table S2. Drug-processing genes are the most significantly up-regulated genes during HepaRG differentiation, including many Phase I enzymes (such as CYP2C9, CYP2C19, CYP2E1, and CYP3A4) and Phase II enzymes (e.g., UDP-glucosyltransferase and UDP-glycosyltransferase). Although both undifferentiated and differentiated HepaRG cells are very similar to primary human hepatocytes at whole genome gene expression, differentiated HepaRG cells express xenobiotic-processing genes more similar to primary human hepatocytes than undifferentiated HepaRG cells. Similarity is also high between primary human hepatocytes and liver tissues (r = 0.920 in Fig. 1B), but with approximately 20% of probes expressed differentially (Fig. 2). Although hepatocytes are the major types of cells in liver, making up to 70 to 80% of the mass of the liver, liver also consists of several other types of cells, such as cholangiocytes, endothelial cells, hepatic stellate cells, and Kupffer cells, which have different gene expression profiles than hepatocytes. Other factors that can influence the measurement of gene expression in human livers are the procedures for harvest, treatment, and storage of liver tissue samples. Therefore, freshly isolated primary human hepatocytes should be considered as the key reference for comparison of gene expression between the in vitro cultured liver cells and the in vivo liver cells. The similarity levels represented by the Pearson product-moment correlation coefficient (r) value and number of the nondifferentially expressed probes were higher between HepaRG cells and primary human hepatocytes or liver tissues than between HepG2 cells and primary human hepatocytes or liver tissues, whereas the differences were lower between HepaRG cells and primary human hepatocytes or liver tissues than between HepG2 cells and primary human hepatocytes or liver tissues. These data indicated that HepaRG cells expressed genes at a genome-wide level more similar to primary human hepatocytes and human livers than HepG2 cells. The above conclusion is also supported by principal component analysis, which confirms that the variations in gene expression at a whole genome level are contributed mainly from HepG2 cells compared with HepaRG cells, primary human hepatocytes, and liver tissues. Hierarchical clustering analysis also shows that the association of gene expression at genome levels is closer in each type of the groups than between different types of the groups (Fig. 4A). Within each type of the groups, undifferentiated HepaRG cells have the closest association, whereas liver tissue samples have the least association. Between different groups, undifferentiated HepaRG and differentiated HepaRG cells are close to each other, and primary human hepatocytes and liver tissues are close to each other. Then, HepaRG cells are closer to primary human hepatocytes and liver tissues than HepG2 cells. 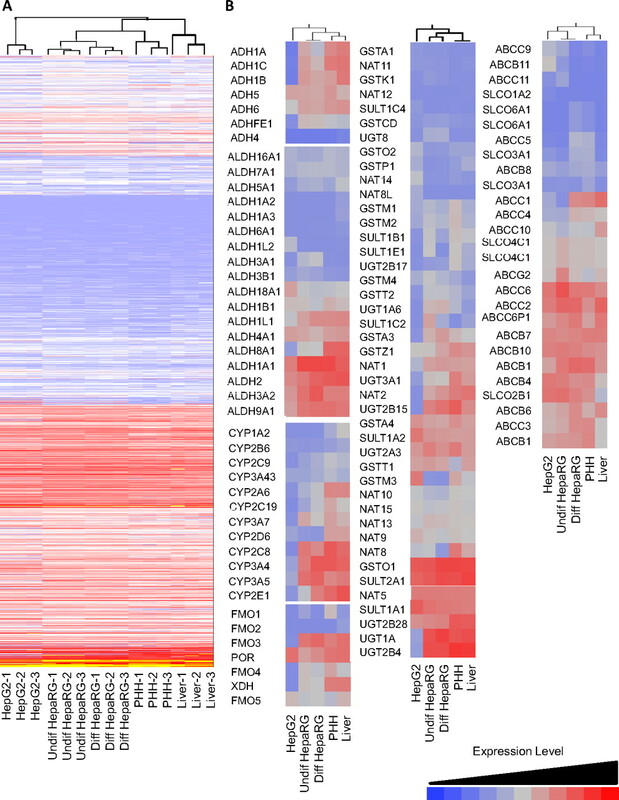 When a set of genes involved in drug response, including many Phase I enzymes, Phase II enzymes, and transporters, was selected for a clustering analysis (Fig. 4B), the gene expression profiles were also more similar between HepaRG cells and human primary hepatocytes or liver tissues than between HepG2 cells and human primary hepatocytes or liver tissues. These findings are in agreement with several previous studies (Aninat et al., 2006; Le Vee et al., 2006; Richert et al., 2006; Kanebratt and Andersson, 2008a,b). When the differences in expression levels among HepG2, HepaRG, and primary human hepatocytes were compared in the major drug-response gene families, such as P450s, ADHs, ALDHs, FMOs, NATs, GSTs, SULTs, UGTs, ABCBs, ABCCs, ABCGs, and SLCOs (Supplemental Fig. S1), the differences between HepG2 and primary human hepatocytes were much larger than the differences between HepaRG and primary human hepatocytes for most genes. In conclusion, we used a high-throughput genome-wide approach to define gene transcriptional profiles of HepaRG cells at both differentiated and undifferentiated stages and compared the gene expression profiles of HepaRG cells and HepG2 cells with human primary hepatocytes and liver tissues. We found gene transcription levels in HepaRG cells have a much higher level of similarity to human primary hepatocytes and liver tissues compared with HepG2 cells (the most commonly used cultured cells for studying liver biology). The transcriptomic similarity of HepaRG with human primary hepatocytes is encouraging for use of the HepaRG cells in the study of xenobiotic metabolism, hepatotoxicology, and hepatocyte differentiation in the future. These sets of data can also serve as a database for researchers who want to compare expression levels of any genes in HepaRG cells, HepG2 cells, primary human hepatocytes, and human liver tissues. The current study highlights the similarity of gene transcription between HepaRG cells and human primary hepatocytes or liver tissues compared with HepG2 cells. The high similarity at mRNA levels between HepaRG cells and human primary hepatocytes or liver tissues does not necessarily mean that the similarity occurs also at protein levels. Studies of genome-wide protein levels require high-throughput protein arrays, which are not currently available. It is also worth noting that because a trisomic chromosome 7 exists in HepaRG cells, genes located on chromosome 7 may have higher expression levels in HepaRG cells than in primary human hepatocytes because of the extra copy of chromosome 7. This factor should be taken into consideration when an experimental design in the use of HepaRG cells involves genes located on chromosome 7. We thank the Kansas University Medical Center-Microarray Facility (KUMC-MF) for generating array datasets. This work was supported in part by the National Institutes of Health National Center for Research Resources [Grant P20-RR021940]; the National Institutes of Health National Institute of General Medical Sciences [Grant R01-GM087376]; Madison and Lila Self Graduate Fellowship from the University of Kansas (to S.N.H. ); and University of Kansas Medical Center Biomedical Research Training Program (to Y.L.). The Microarray Facility is supported by the Kansas University School of Medicine, KUMC Biotechnology Support Facility, the Smith Intellectual and Developmental Disabilities Research Center supported by the National Institutes of Health National Institute of Child Health and Human Development [Grant HD02528], and the Kansas IDeA Network of Biomedical Research Excellence supported by the National Institutes of Health National Center for Research Resources [Grant 2P20-RR016475]. ↵ The online version of this article (available at http://dmd.aspetjournals.org) contains supplemental material. solute carrier organic anion transporter family. (2006) Expression of cytochromes P450, conjugating enzymes and nuclear receptors in human hepatoma HepaRG cells. Drug Metab Dispos 34:75–83. (2002) Infection of a human hepatoma cell line by hepatitis B virus. Proc Natl Acad Sci USA 99:15655–15660. (2007) The human hepatoma HepaRG cells: a highly differentiated model for studies of liver metabolism and toxicity of xenobiotics. Chem Biol Interact 168:66–73.
. (2007) Primary hepatocytes: current understanding of the regulation of metabolic enzymes and transporter proteins, and pharmaceutical practice for the use of hepatocytes in metabolism, enzyme induction, transporter, clearance, and hepatotoxicity studies. Drug Metab Rev 39:159–234. (2003) Summaries of Affymetrix GeneChip probe level data. Nucleic Acids Res 31:e15. (2008a) Evaluation of HepaRG cells as an in vitro model for human drug metabolism studies. Drug Metab Dispos 36:1444–1452. (2008b) HepaRG cells as an in vitro model for evaluation of cytochrome P450 induction in humans. Drug Metab Dispos 36:137–145. (2009a) Dose- and time-dependent effects of phenobarbital on gene expression profiling in human hepatoma HepaRG cells. Toxicol Appl Pharmacol 234:345–360. (2009b) Reproducible chemical-induced changes in gene expression profiles in human hepatoma HepaRG cells under various experimental conditions. Toxicol In Vitro 23:466–475. (2002) Timing of new black box warnings and withdrawals for prescription medications. JAMA 287:2215–2220. (2006) Functional expression of sinusoidal and canalicular hepatic drug transporters in the differentiated human hepatoma HepaRG cell line. Eur J Pharm Sci 28:109–117. (2000) Expression and regulation of cytochrome P450 enzymes in primary cultures of human hepatocytes. J Biochem Mol Toxicol 14:177–188. (2004) CYP3A4 induction by xenobiotics: biochemistry, experimental methods and impact on drug discovery and development. Curr Drug Metab 5:483–505. (2002) Selective suppressions of human CYP3A forms, CYP3A5 and CYP3A7, by troglitazone in HepG2 cells. Drug Metab Pharmacokinet 17:42–46.
. (2000) Concordance of the toxicity of pharmaceuticals in humans and in animals. Regul Toxicol Pharmacol 32:56–67. (1987) Drug metabolism by the human hepatoma cell, Hep G2. Biochem Biophys Res Commun 143:52–57. (2006) affylmGUI: a graphical user interface for linear modeling of single channel microarray data. Bioinformatics 22:897–899. (2004) A model-based background adjustment for oligonucleotide expression arrays. J Am Stat Assoc 99:909.